The Cavalier King Charles Spaniel is a graceful and elegant toy dog breed that was developed to accompany the Ladies of nobility and aristocracy during the reigns of both King Charles I and King Charles II. They are an affectionate breed that displays a loving nature toward everyone, but especially children. They are one of the most tolerant dog breeds when it comes to the antics of children. They are a gentle breed, particularly with children and the elderly, but do have a happy character. This happy character and gentle disposition, enables them to do well as therapy dogs. Their friendly nature and calming demeanour have endeared them to many families over the course of their history. Cavalier King Charles Spaniels well and truly deserve their reputation as one of the gentlest dog breeds available. Cavaliers are also very willing to please their owners, and the slightest inclination that their owners are upset with them, will usually result in the Cavalier rolling over onto its back in submission. This willing to please attribute makes them quite easy to train, with many Cavalier King Charles Spaniels performing well at obedience trials. Being a breed that were valued for their appearance, rather than working ability, they have been bred to fit a particular look rather than function. This was happening to many breeds at a time when dog shows were becoming popular. Prizing dogs for a particular ‘look’ led to breeders selecting for dogs that matched the desired look over the function and health of the dog. The trend at the time was a short, to almost flat face with a small head. This type or look, is still popular today in the dog show community and may well be a contributing factor to a proportion of Cavalier King Charles Spaniels suffering from a medical condition known as syringomyelia. Estimates range from 60 – 90% of Cavaliers having this condition. Syringomyelia is a result of a reduced skull size that compresses the brain with a range of symptoms from mild irritation and discomfort to severe pain, seizures and partial paralysis. A heart disease known as Mitral Valve Disease (MVD) is also very common in Cavalier King Charles Spaniels with an estimated 50% of Cavaliers developing heart murmurs by 5 years of age, resulting in the unfortunate premature death of many Cavaliers. Progressive Retinal Atrophy (PRA) is another genetic condition that affects Cavalier King Charles Spaniels, although not as commonly as Syringomyelia or MVD. PRA is a degenerative eye disease where the affected dog gradually becomes blind over time. It’s age of onset ranges but is often at about 5 years old were the dog’s vision gradually reduces to complete blindness over the course of a year. Fortunately, genetic testing is available to screen breeding dogs for this inherited disease, and responsible breeders will test their dogs prior to breeding to eliminate the chance of this degenerative disease from affecting the puppies they breed. Overall, the modern Cavalier King Charles Spaniel is one of the most gentle and trustworthy family companions. Unfortunately, this family dog is plagued by a number of significant health issues that reduce both the length and quality of their lives. The Beagle has been a favourite breed for Australian families for many generations. Many Australians have fond memories of Beagles during their childhood of their own dog or of friends or neighbour’s dogs. Their lively character and easy going demeanour made them popular in years gone by as well as today. They are a hardy and robust breed that can take the rough and tumble of the kid’s games in their stride and continue to want to play for hours. These dogs were breed to work as a pack and take their role in their pack (dog or human) very seriously. This allows them to bond with their human family like few other breeds do. Beagles were originally bred as a scent hound to follow a scent of the prey animal for the hunters to locate. To do this job well, they needed a strong drive to follow their nose, and this is still possessed by the breed today. While great for hunting, this high scent drive can be a problem in the modern environment. Beagles can be difficult to recall when off the lead and following a scent, appearing deaf to the sound of their owner’s voice calling them back. Although they have also been show dogs, Beagles have a long history of being bred to work and that continues today. While this results in a high energy dog that can be difficult to keep in line, the breed has benefited significantly in terms of health. Breeding dogs were selected based on their ability to work, get along with each other and people, but also to be robust, with enough energy to keep up with the hunt. This role needed dogs that were healthy and robust over dogs that were pretty for the show ring. Unlike other breeds that were valued more for their appearance in the show ring, Beagle breeders valued health and ability above all else. Even though Beagles have become popular in the show ring, they are one of the healthiest pure bred dogs available today. Still, Beagles can suffer from health issues like any other breed. Their love of food can make them prone to obesity if they are overfed with most Beagles being heavier than they should be. Progressive Retinal Atrophy (PRA) also affects this breed with responsible breeders screening their breeding dogs to remove this genetic blindness disease from their lines. Beagles can also be susceptible to “cherry eye” (a prolapse of the gland of the third eyelid). Cherry eye looks like a pink lump in the inner corner of the eye. Minor surgery is used to correct this painless condition. While they do have a few health conditions to be aware of, overall, the Beagle is a healthy and robust dog that wants to join in with the family (it’s pack). They do have a high amount of energy to burn off and require regular exercise in order to keep them healthy and make them easier to live with. The aim of Beaglier breeders is a gentle family companion that retains the health and vitality of the Beagle, with toning down its high energy and hunting drive. The Cavalier King Charles Spaniel complements the Beagle well in reducing the hunting drive while increasing the level of affection in the Beaglier puppies. Thanks to the Cavalier, the Beaglier has a nature that is much more willing to please than the Beagle. Beagliers are also more gentle with young children than Beagles, and are less likely to knock them over. Beagliers still retain the robust health of the Beagle with generally few health issues. Screening for genetic conditions such as PRA that are present in both the parent breeds is highly recommended and performed by ethical and responsible breeders. Obesity can still be an issue in Beagliers as it is in Beagles as they often retain the appetite of the Beagle. This can be managed by controlling the diet of Beagliers to limit the amount of excess calories they consume. Many owners will use their appetite to make training using positive reinforcement easier and more effective. Positive reinforcement training involves rewarding the dog for good behaviour with something they desire. Beagliers with a love of food can be easily bribed with food to get them to follow instructions and change unwanted behaviours. Beagles are hounds and Cavaliers, despite being classed as toys for the show ring, are spaniels, and thus have separate lineages. The crossing of dogs of different breeds and particularly from different lineages can result in a genetic phenomenon known as hybrid vigour. Hybrid vigour can result in the offspring being healthier than either of the parent breeds. The exact mode of action is not entirely clear but current thinking is that the hybrid offspring have greater genetic variation, allowing them to both fight off disease better and have a lesser chance of inheriting identical copies of faulty genes. This combination of a healthy, robust, family orientated dog that is gentle and tolerant with children has made the Beaglier one of Australia’s most sought after family dogs. 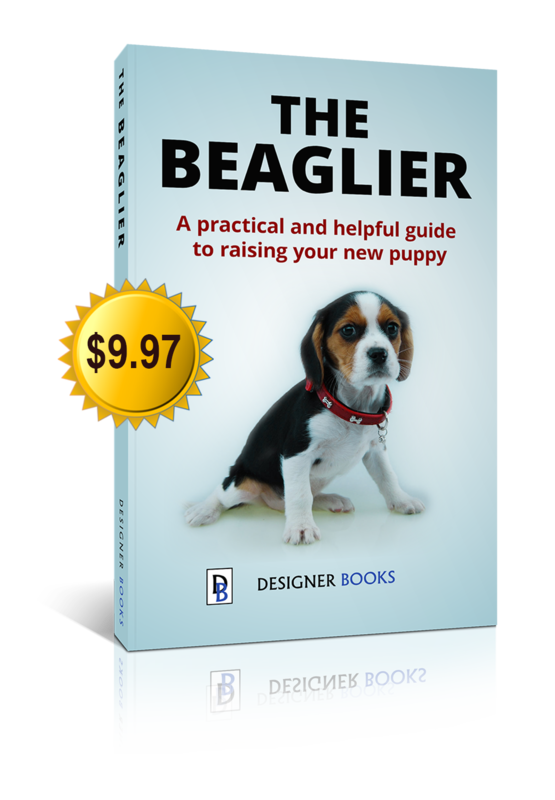 It is their physical and temperamental attributes that get the Beaglier recommended to families looking for an outgoing, healthy and gentle family companion by owners, veterinarians and other dog professionals.